North West - Lloydminster (YLL), Meadow Lake (no listing) and areas. Central - North Battleford (YQW), Saskatoon (YXE), Prince Albert (YPA) and areas. SouthWest - Swift Current (YYN) and area. South Central - Regina (YQR) and area. South East - Yorkton (YQV), Broadview (WIK), Estevan (YEN) and areas. Severe Weather - Weather Warnings Saskatchewan weather watches and warnings issued by Environment Canada. Saskatchewan Highway Conditions - High-Bandwidth Map Maps highway conditions. From Saskatchewan Highways & Transportation. Saskatchewan Highway Conditions - Map Maps highway conditions. From Saskatchewan Highways & Transportation. Saskatchewan Highway Conditions Highway conditions. Text report. From Saskatchewan Highways & Transportation. Weather Office Environment Canada's weather site for Saskatchewan. Weather Summary Weather conditions summary for Saskatchewan locations.. Weather Network Canada's 24hr a day weather network. 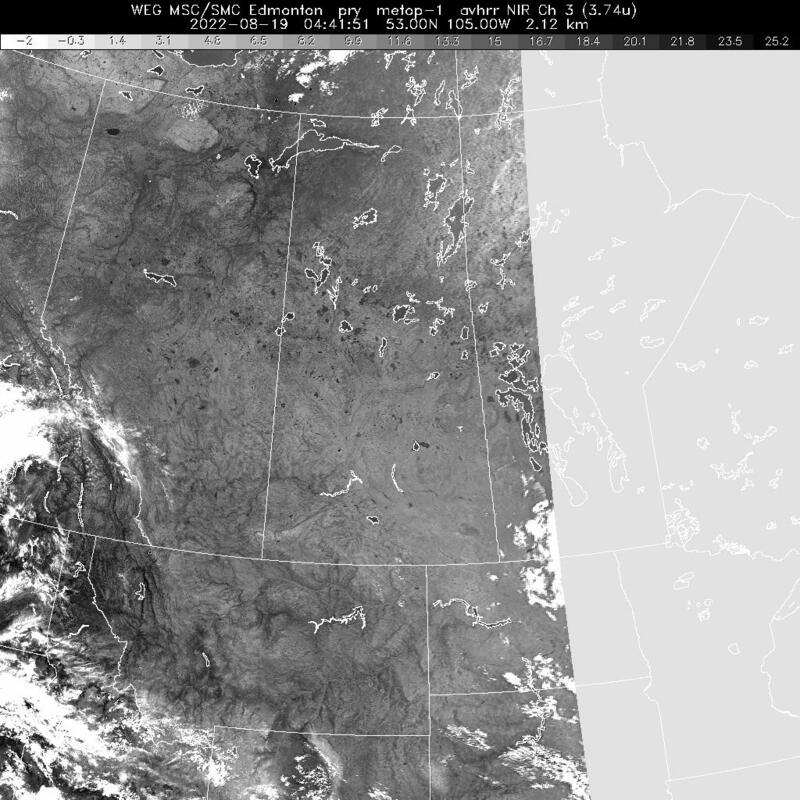 Satellite - Western Canada - Visible Operational during daylight hours. Satellite - Saskatchewan Cloud Cover Latest high resolution image. Satellite - Saskatchewan Cloud Cover Animation.